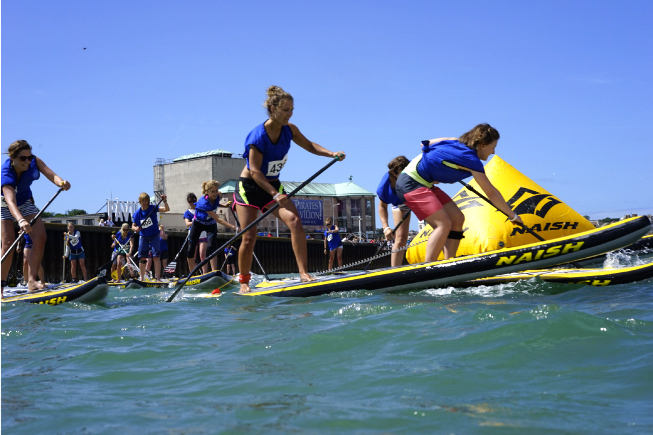 “Naish International SUP Class Organization” which is a one design racing class where all riders compete exclusively on the ONE 12’6”. It offers a fun, fair, and cost effective competition format for all contestants, regardless of size or experience. N1SCO favorite Casper Steinfath kept the inflatable theme alive at the Head Of The Dart race last weekend by taking on the Mens elite fleet with his new Naish Maliko Inflatable 14' X 25. Here is the sprint for the finish to take 4th overall in a highly competitive fleet full of skinny Carbon hard boards. Proof that N1SCO paddlers can hold their own in any race. Here is multiple N1SCO Champion Andrea Richardson bringing home another National Title in the 200m BCU Sprint Championships on her Naish Maliko 14' X24. This win qualifies Andrea for a position in the World Championships this year so an awesome achievement. Go Andrea! Video highlights from the 2019 Britsh Canoeing National Sprint Championships. Ok, so it is not N1SCO but we have some pretty big news about the stiffness of our new inflatable SUP board line that launched yesterday. They are seriously stiff, find out how we came to this conclusion. With our new inflatable's we've been saying Stiffer is Better, but how is that determined. Naish engineer Damien Girardin explains how we developed the Standard Stiffness Rating to see how we stacked up against the competition.